Remove heavy imperfections while leaving behind a great deal of gloss! The Sonax CutMax was designed to remove heavy imperfections while finishing down extremely well! The highly corrective paste formula helps remove up to 1500 sanding marks and other heavy imperfections from severely weathered paint with ease. CutMax is water-based which allows for a long working time and it will not dry out like other compounds. This means dust free polishing so you don't have to clean up that annoying dust! After application, simply wipe off the polished area with a clean microfiber towel and you're done. Even though you will have a great deal of gloss left behind, you still may need to follow up with a lighter polish. If this is the case, the Sonax EX 04-06 is a perfect follow up to remove the haze and finish the paint down. This unique polishing formula is solvent, silicone, and petroleum free, making it body shop safe. If you are looking for a great heavy cutting polish, the Sonax CutMax is a great choice! 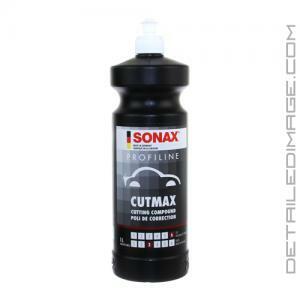 Sonax CutMax is definitely a great product that I see us using regularly. On medium to soft paint such as this one, it will perform very well at correcting the paint and leaving a finish that's easily refined with a quick pass with any finishing polish. I believe when used with foam pads it will leave a great finish and on some harder paints may even be considered as a 1-stage polish to both correct and leave a great finish. Highly abrasive cutting compound for polishing sanded or severely weathered paint surfaces. Enormous cutting power. Odorless water-based formulation. Sand to P1000 or finer then wipe clean. Apply a small amount of polish to each area. Polish with a SONAX Polishing Pad (493 100) for approx. 10 seconds at low rotational speed and exerting increased pressure, slightly tilting the machine. Afterwards, exerting slight pressure, polish with flat pad for 20 seconds. Remove polish residues with SONAX Microfibre Cloth ultrafine (450 700). Use SONAX ProfiLine Perfect Finish (224 300) or SONAX ProfiLine EX 04-06 (242 300) to achieve perfect, high gloss results. PLEASE NOTE: Do not allow polishing area to overheat. Regularly clean polishing pads. Never use different polishes on one pad. Keep from freezing. Sonax Cutmax is a really good product. If you are looking for the best cutting compound hands down you just found it. Creamy feel yet this stuff really works. Very easy to work with. I combined this with Meguiars Microfiber Cutting disc. When you want the best and won't settle for less this is it. I had very fine scratches all over my car. This product made the scratches disappear. And there wasn't a lot of dusting. Gave a very shiny finish and wasn't hard to work with. Matter of fact it was very easy to work with.This will be my go to product from now on. This product does what the name indicates, it cuts to the max. I enjoy using this product when it comes to any spot repairs or high traffic areas like door pockets.